This month Featured Illustrator welcomes Dave Gray, one of the illustration winners of this year's SCBWI Undiscovered Voices anthology. 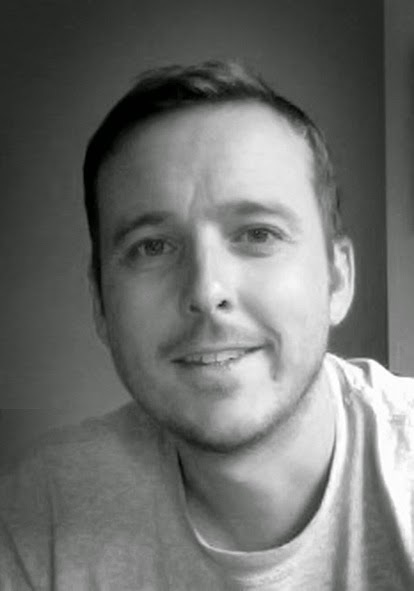 From his studio in the West Midlands, Dave uses both traditional and digital media to produce energetic characters and settings. See more examples of his work on the Featured Illustrator Gallery page. I wasn’t a very good reader at school. Academically I was fine but my spelling was very poor and I found long texts a bit of a struggle. The positive side of this was that I was drawn to more visual books where the illustration really took a front seat. I loved reading comic books like The Beano and Tintin as well as educational books with lots of pictures. I also loved the madcap inventions of Heath Robinson and even had a go at building a few of my own! 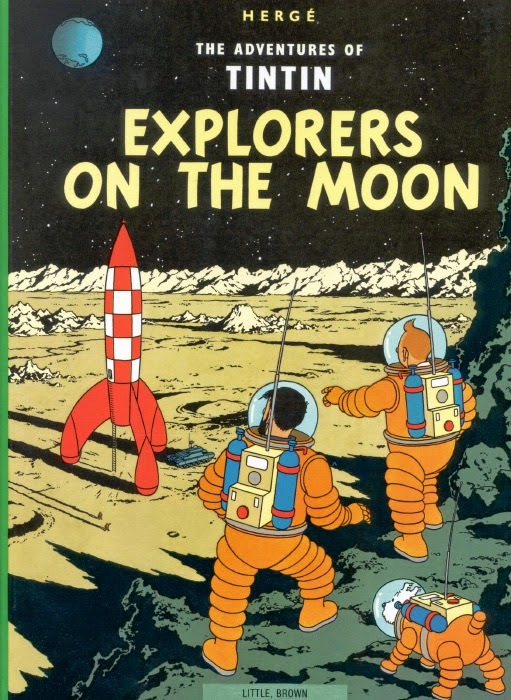 Tintin goes to the moon in one of my favourite childhood books. 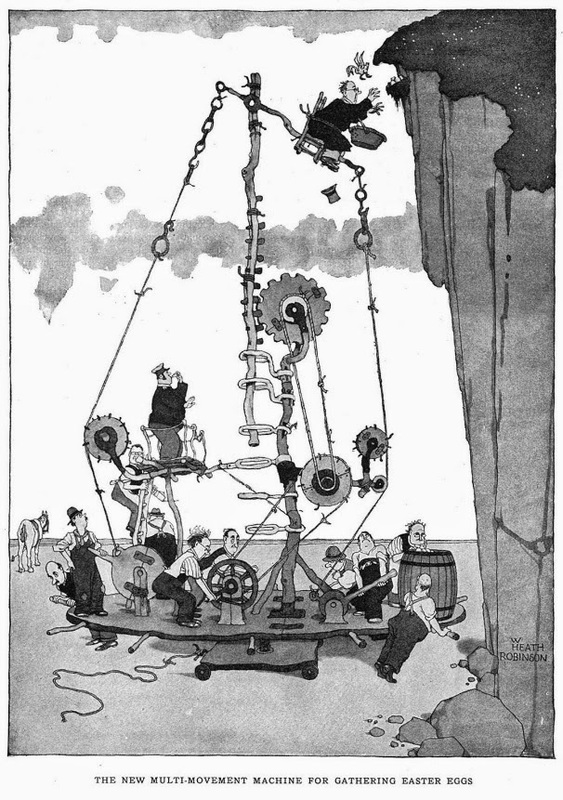 The wonderful inventions of Heath Robinson kept me entertained for hours. I knew I wanted to do something creative but there were lots of other kids at school who were much better at drawing than me so, when I left, I studied graphic design at art college in Chester and then Coventry University. I liked that it was creative, practical and all about communicating ideas. I could also disguise my lack of illustration ability. I remember taking a life drawing class at college and overhearing someone joking that my picture of a middle-aged woman looked like Neanderthal Man! (It really did as well!) So I left drawing behind for a long time — computers felt much safer. In my final year at university I won a BBC/BAFTA award for interactive design. I began working in print and web design for organisations like the BBC and although I was getting to be creative I felt unfulfilled. I picked up drawing again sporadically but I was truly awful and hated everything I produced. It took a long time and a lot of doodling to start creating things that I felt had any potential. I really loved American indie comics by authors like Chris Ware, Dan Clowes and Adrian Tomine which have clean lines, muted colour pallets and 1950s aesthetics. To me they were like Tintin for grownups. 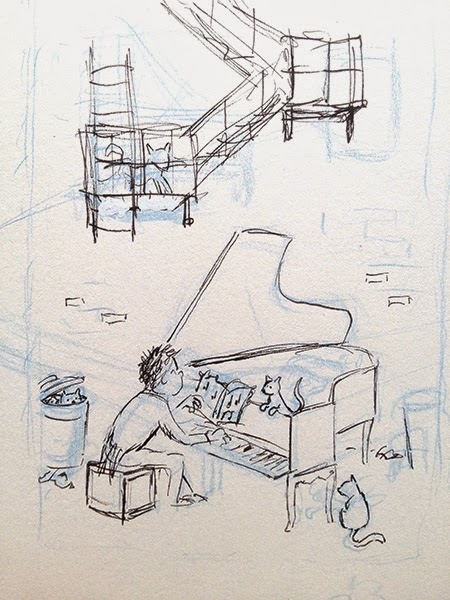 I loved the idea that as an author illustrator you could create a whole world and all the characters in it so I began toying with the idea of graphic novels. 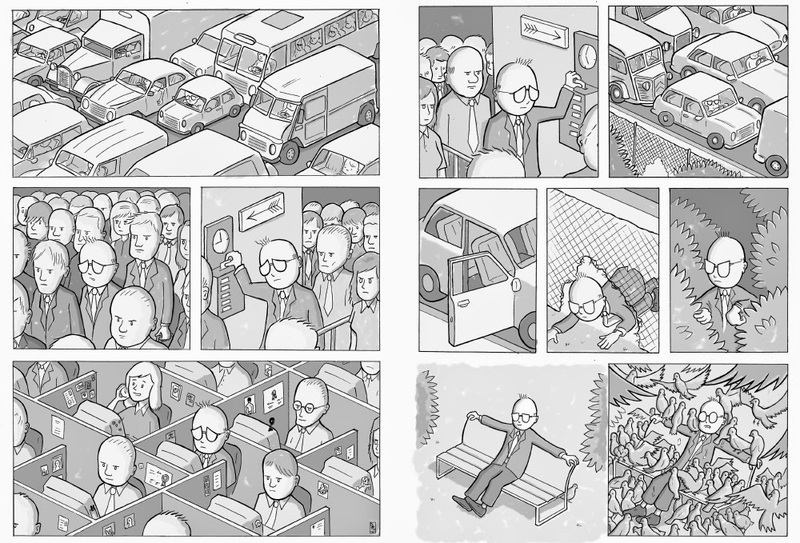 The work of Chris Ware was a huge inspiration to me. At that time I was working for Arts and Media organisation Hi8us. We ran a lot of professionally led film and media projects with hard to reach young people. A real turning point for me was when we ran a series of comics workshops led by amazing cartoonists like Hunt Emerson (The Beano,) Andi Watson (Oni Press/Dark Horse Comics) and John McCrea (Marvel/DC). I found myself being inspired and learning about illustration directly from some of the people I’d admired for a long time. As a result of this I started producing self-published comics which received some really favourable reviews in the comics press but I found that as a self publisher you really need a lot of self-confidence to be able to promote your work. Also graphic novels are seriously hard work requiring six or nine panels per page. That might be 18 illustrations on a double page spread! Urban Trap. A two page silent story I made when I was creating self-published comics. I began to incorporate more illustration into design projects for companies like Channel 4 and The Prince’s Trust and also did editorial work for some small magazines which was often unpaid but gave me a chance to practise. Invariably, when I had children, I was more drawn towards picture books and rediscovered many of the books I’d had as a child by masters like Sendak and Dr Seuss. I loved sharing them with my own children and seeing them discovering these magical worlds for themselves. 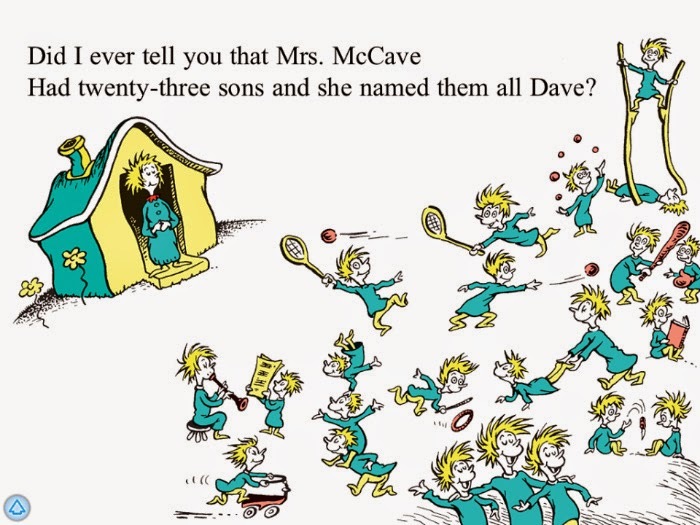 Too Many Daves by Dr Seuss. A subject close to my own heart! I started trying to figure out how to write and illustrate picture books myself but I didn’t really know what I was doing. I think I made the typical mistake of thinking it was going to be really easy! Fortunately I discovered SCBWI and got involved in critique groups and workshops and started meeting fantastic people who really knew what they were talking about, were willing to help and could steer me in the right direction. 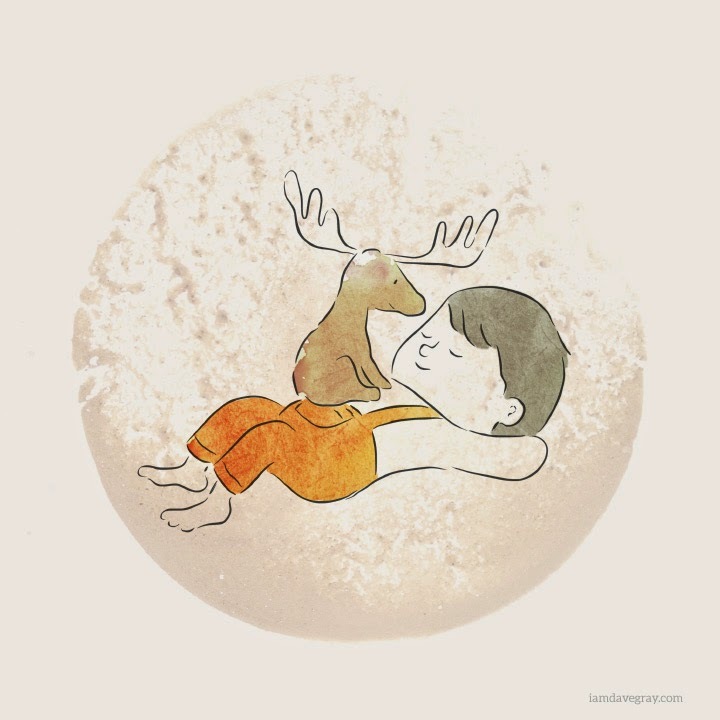 I decided to enter Undiscovered Voices for illustration and was lucky enough to be picked as one of the 2014 winners which has opened a lot of doors and led to discussions with agents and editors. It’s also given me permission to start prioritising my illustration and writing work over some of my bread and butter design jobs. 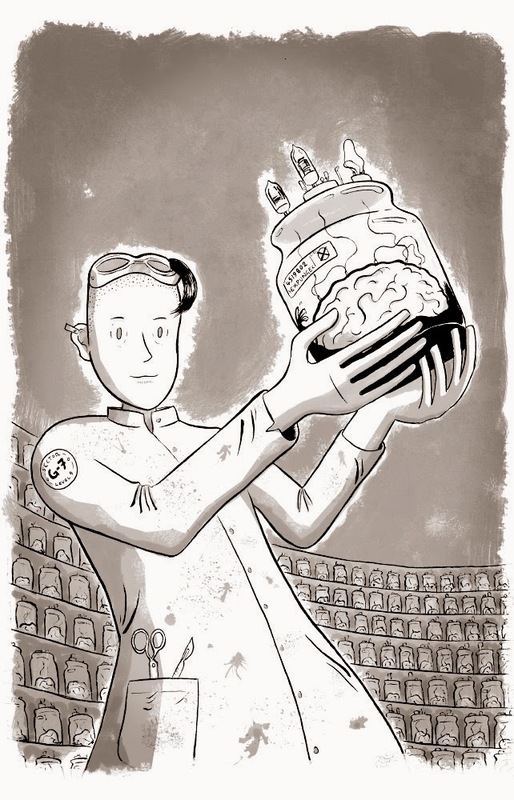 My winning image for SCBWI Undiscovered Voices 2014 based on Sara Grant’s story Brainless. I usually begin with either an idea or a doodle. I always start on paper but it’s often at a very small size. I use a light blue pencil to sketch with as it has a really nice feel and allows me to find a line without making lots of dark pencil marks. I love to doodle in boring meetings or in front of the TV and let my mind wander. If I think too hard I usually spoil it! Afterwards I’ll look at what I’ve done and decide if any of it is usable. I get my ideas down on paper and then finish things off digitally. Once I have a sketch then I’ll sometimes ink directly over it or use a lightbox. I like using fine-liners and brush pens. If I’m happy with that then I’ll usually scan and colour in Photoshop which usually involves lots of layers and blending modes. Or I might scan and redraw the outlines in a vector program like Flash or Illustrator which gives clean scalable lines and ultimate control. I always want to avoid it looking too digital though so I have created brushes that give the look I want although I’m always experimenting. After the line work is finished then I’ll colour and add texture in Photoshop. Often I’ll find textures around me and photograph them. 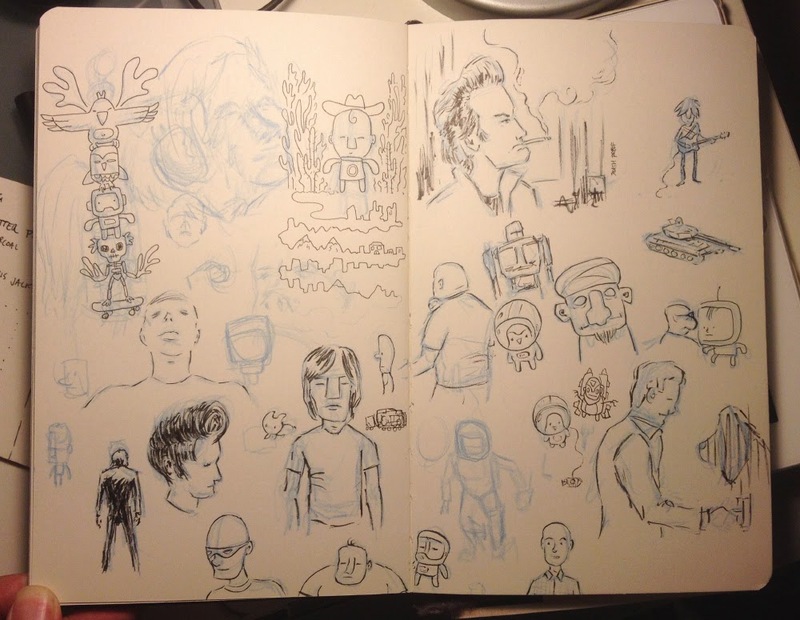 I tend to fill my sketchbooks with random thoughts and images. 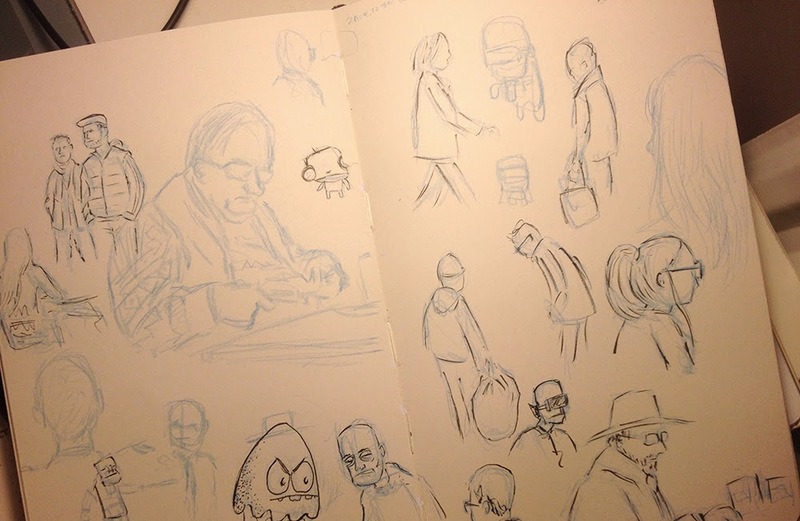 I like to get out into the street and draw people from life. 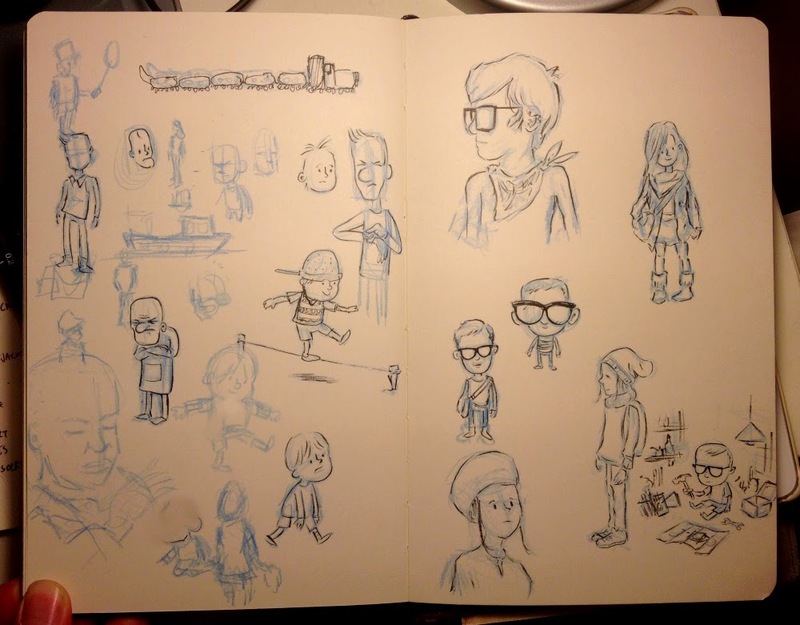 Most characters start life as doodles in my sketchbook. Textures are everywhere. To make the background texture for this image I took a picture of the inside of my hot chocolate mug after I’d finished drinking it. I’ve always tried to maintain a graphical feel to my work and I never look at the years I spent designing everything from animated websites to training manuals as wasted. I think a lot of that work has formed a foundation for my illustration and informed my approach to it. I’ve started to get enquiries from art directors and editors which is really exciting. At times I’ve been frustrated, wanting to be published yesterday but then I realised that I just need to really enjoy what I’m doing and the rest will hopefully follow in time. I feel like I’m at the beginning of an exciting journey with lots still to learn and discover but I’ve already met some amazing people along the way. 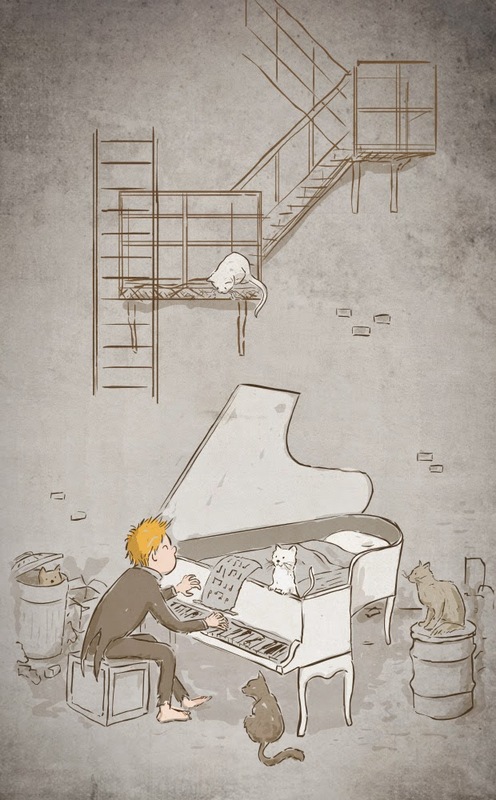 See more of Dave's work in the Featured Illustrator Gallery. Fantastic article, Dave. Wonderful to see your work on display here. Enjoyed reading about your illustration journey thus far and seeing more of your work and hearing about your process! Great article, Dave. Pleased to know you!!! Well done Dave, excellent piece on your fascinating journey! Congratulations Dave - lovely work. Good luck with everything! Great stuff, Dave! Now where can I buy your blue pencil? I love your style Dave - can't believe that you haven't always been brilliant at drawing. But it's inspirational to discover that a person can learn to draw. Also i think that not being brilliant at drawing from the start might have meant that you wouldn't have discovered the full extent of your creativity - who would have thought that the inside of a coffee cup would make the perfect background! Thanks for a great read, Dave. Hello Dave. Congratulations, you deserve the success you have achieved so far; many others would have given up by now, but you have proven that there is a niche for everyone, if you just believe and keep going. :) I took two of your cards at the retreat as I loved the illustrations so much and have pinned them up with other faves! Great article. Great article Dave. I love the hot chocolate mug picture. It's soooooo cute! I want to be there when the little boy opens his eyes!